I read Telegraph Avenue this summer as part of As the Crowe Flies (and Reads!) pre-publication readalong. Though I did post a wrap-up response to the book, I'm compiling all of my thoughts together here. This is less true review (it's nearly impossible to summarize the complicated interwoven stores in any concise way) than a series of reactions to a book that I did, eventually, come to love. 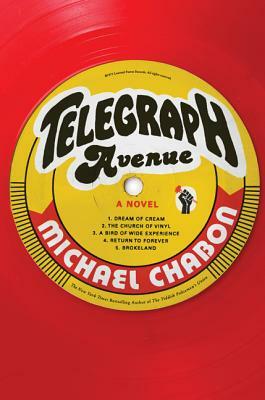 The latest novel from Michael Chabon (The Adventures of Kavalier and Clay) centers on a white family and a black family, co-owners of a used vinyl shop located on the quintessential Telegraph Avenue. Except that it was not quintessential enough for me to immediately know what it was, so I went a-Wikipediaing. Turns out it is a well-known street in Oakland, California, notable as a "home to many restaurants, bookstores, and clothing shops, along with street vendors occupying its wide sidewalks." Apparently, it also "attracts a diverse audience of visitors, including college students, tourists, artists, street punks, eccentrics, and the homeless." That's helpful to know going into this book, as Telegraph Avenue functions as much as a character as it does a setting. And I love that in a book. Authors that can make places as important as people are awesome. To Ayelet, from the drop of the needle to the innermost groove. Call me Ishmael. --Ishmael Reed, probably. Then I read the next fifty pages and was all I HAVE NO IDEA WHAT IS HAPPENING OR WHO ANY OF THESE PEOPLE ARE. It is the beauty of these wonderfully crafted sentences that carries Chabon's story, as the story itself is somewhat slow, at times plodding, and often diverted. He uses words in the most precise and careful way to illuminate what is most important. Above, it is the power of food to bring back a memory, and not just a specific memory, but an entire bank of memories, of a time, and a place, and a person, and a feeling. His descriptions elevate the food beyond food and into the realm of the surreal; Nat's fried chicken is not just a meal, but an invitation. Chabon continues to pry at the issue of race--as well as the similarly meta-issues of poverty, death, and family--in this careful, subtle way throughout the novel. Coupled with beautiful prose and the ability to highlight the mundane in the most intricate of ways, the result proves a cohesive, often humorous novel that deals with some of the most important issues of our time. Chabon's writing requires a little work (and not just in remembering everyone's nicknames); he drops you off in the middle of the story with little background information or development, and expects you to keep up. It's not easy, but it's doable--and in the end, worth it. Provided, that is, that you can forgive the 12-page sentence that makes up the entirety of Part III, which will, if nothing else, leave you breathless. Note: Thanks to the publisher for providing review copies of this title for the readalong this summer. It's been interesting to see the range of opinions on this one- it's one I hope to get to eventually, I'm definitely intrigued! I have to confess to having struggled with Yiddish Policeman's Union and never quite got through it.